This is the first in a series about how nine clients and friends successfully transitioned or transformed their careers after age 50. This month I will be describing how one former client shifted from corporate to non-profit after age 50. 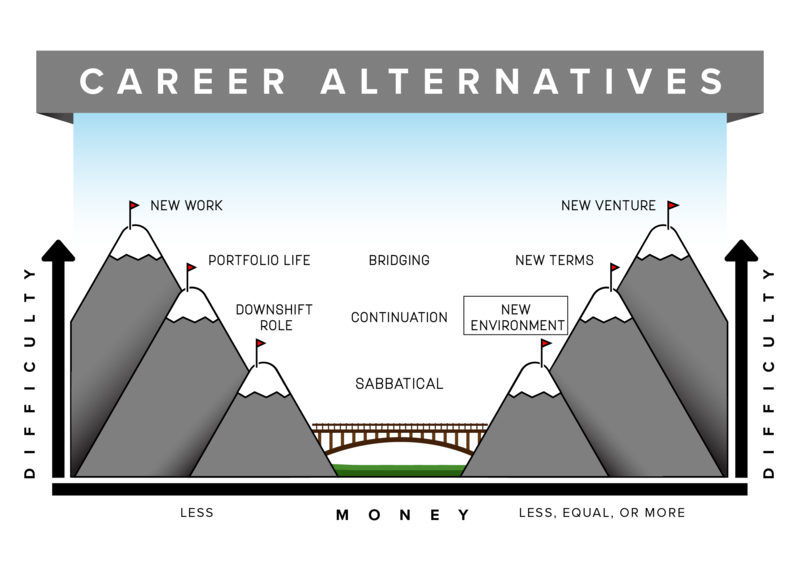 The graphic above reveals the degree of difficulty and the economic considerations when seeking a new work environment. This career alternative involves change of industries, work culture, size or type of firm, but continuing in a similar function. While preparing to share her story, I asked Sandy to consider what most readers would like to know about her and her journey. First, I asked about her background, who she is and where she worked before her transition. Second, what was the catalyst for her career change? Third, what were the results of her search, and how and where did she ultimately land? Fourth, I asked Sandy for reflections and lessons learned which could help others who might be considering a similar next step for their career. Sandy worked in corporate America for over 30 years. Her functional area was information technology leadership, and she had spent 24 years at the same large company, with steadily increasing responsibilities. Sandy was high performing and had consistently been rated as a high potential employee. In her early 50s she had assumed that she had to stay, and there were no options for change at her age. Sandy began to realize that what had long been considered an asset to the organization was no longer valued. Earlier in her career she found that challenging and bringing new ideas were highly valued. This was not the case in recent years. She noticed that leaders were chosen and advanced because of a similarity in style and profile that did not match hers. Due to a significant industry downturn, major shifts in top leadership and culture had taken place over the past five years. The scales had tipped dramatically from creativity and innovation to control. The strengths that made Sandy valuable in the past were liabilities now. Because she was no longer a fit, Sandy needed to find an opportunity that better matched her strengths and values. Sandy also felt strongly that she needed to move to something, not just away from something. She didn’t have many years left to work, and the opportunity to work for a non-profit was going to something she really wanted. She had been evaluating this option for some time, and had decided it was definitely her future career destination. She would not leave to go to another corporate type job. Through networking and some good fortune, Sandy discovered an opportunity to work for a large non-profit. This organization wanted a candidate with IT skills similar to those of her existing job. In spite of what Sandy had heard about the non-profit sector, the pay and benefits for this job were comparable, and in some aspects even better than at her corporate job. She had found an organization that did everything to ensure she had what she needed to work for them. Sandy was thrilled to find the best of what she had experienced years before at her corporate job, before the economic downturn and subsequent shift in leadership and culture. She now works for an organization that truly appreciates her. Sandy can make a big difference in a great organization whose values match hers. Ultimately, each of us desires to use, develop and stretch our talents, in a purposeful way, within an organization that values us and shares our values. Sandy found that early in her career, she had this. The economy and the culture of her organization, however, changed dramatically. In the end, Sandy could no longer say she satisfied any of these desires, especially when it came to being valued and sharing common values with her company. 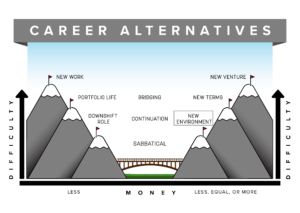 We have three healthy choices at our career crossroads. Stay and accept it, stay and change it, or leave it. If we cannot stay and accept it, cannot stay and change it, then leaving becomes the healthiest choice. Congratulations to Sandy for the courage and good fortune she found in leaving her company of 24 years and finding a great fit for her future. Stories help us understand the realities, struggles and triumphs of life and work. With Sandy’s help, I have told her story in the hope that you will see greater possibilities for yourself and others. Join me next time, as I explore another path of career transition and transformation after 50.